REPNAVAL is a shipyard specialized in repairs, conversions and maintenance of ships weighing up to 5500 MT in dry dock. Its facilities are equipped with 5 slipways ready to dry dock ships of maximum dimensions of 123 meters long and 21 meters wide. In our facilities we have also a 120 meters long fitting pier with a maximum draught of 7 meters. This infrastructure allows us to provide a floating repair service without dry docking. We have at our facilities various types of machinery, from lathes, fixed and portable boring machines, honing machines, an ultrasound machine, state-of-theart machinery for mobile alignment and laser honing. Everything required to provide an efficient service. Environmental and Occupational Health and Safety REPNAVAL’s commitment is to render maximum quality services in keeping with labour risks prevention and eco-friendly activities. We strive to constantly improve. We maintain close, interactive communication with our clients. We apply an Integrated Management System in all our operations. Work is carried out with full guarantee and in accordance to the world`s major classification societies, such as Lloyd´s Register of Shipping, Bureau Veritas, Germanischer Lloyd´s, Registro Italiano Navale, Nipon Kaiji Kyokai, De Norske Veritas, American Bureau of Shipping, etc. Technical Department. Engineering and Projects. Mechanical department. Engines, fuel pumps, regulators, on-site machining, laser alignment, chock fast, spacers, all types of pumps, purifiers, air compressors, turbochargers, pneumatic engine starters, refrigerators, coolers, non-destructive testing, fog detectors, remote-control system, etc. We provide offices and conference rooms with internet access for our clients. Health services for crew on land. Washrooms, showers and toilets: hot and cold water. Kitchen service, dining rooms and refrigerators for crews and used by their chefs. Providing access to the ship. Compressed air service, 7 to 10 BARS. 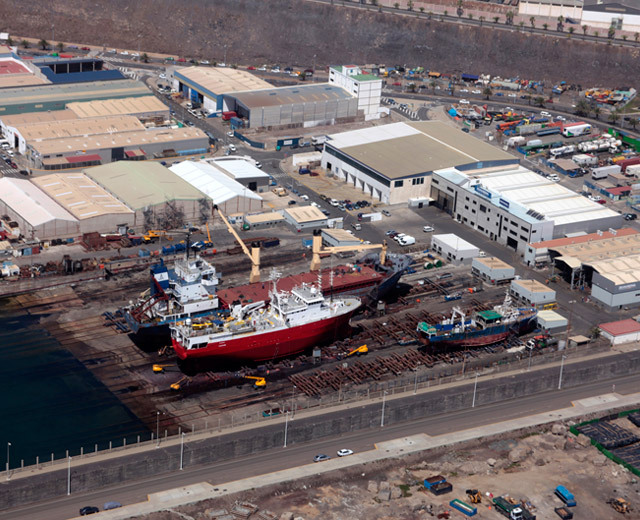 The Port of Las Palmas, also known as Puerto de la Luz or Puerto de la Luz y de Las Palmas, is a commercial and passenger port, with fishing vessels and a yacht marina in the city of Las Palmas de Gran Canaria, Spain. For five centuries, the Port of Las Palmas has served as a traditional stopover and supply base for ships on their way through the Middle Atlantic. The Port of Las Palmas is the first port of the Canary Islands and also the first port in the Middle Atlantic the greatest transit junction between Europe, Africa and America. In turn, it constitutes one of the main ports of Spain and the first of the geographical area of West Africa. The traditional port of call for cruises on this route and where every year over one million passengers, between tourists and passengers of domestic routes, travel between the islands and the mainland.